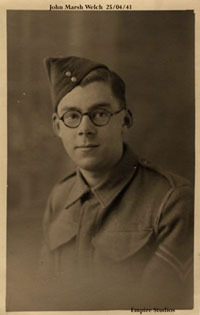 In 1941 during the height of the Blitz, John Welch was an 18 year old corporal serving at Hilsea barracks in Portsmouth. 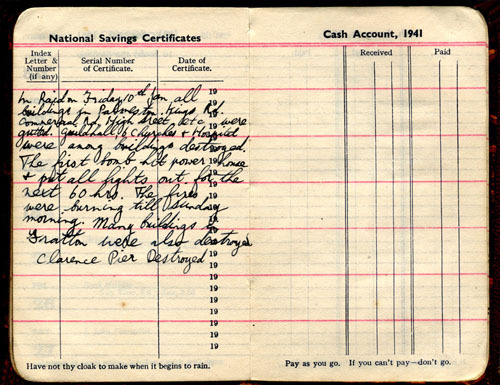 Shown below is his notebook entry for 10th January 1941, the day of one of the biggest air raids on Portsmouth. The documents and picture are coutesy of Penelope Welch, his daughter. Thank you. The first bomb hit power house and put all lights out for the next 60 hours. The fires were burning till Sunday morning. Many buildings in Fratton were also destroyed, Clarence Pier destroyed. Footnote left hand page:- Have not thy cloak to make when it begins to rain. Footnote right hand page:- Pay as you go. If you can't pay-don't go. 1. On the 10th January 1941, 171 people were killed and 430 injured in the air raid on Portsmouth. 2. The Guidhall was hit by incendiary bombs and burned to a shell, it was not reopened until 1959 after extensive rebuilding. 3. In total the Blitz attacks on Portsmouth destroyed 30 churches, 8 schools, 1 hospital and over 80, 000 homes. 930 people were killed and 1,216 people were injured.